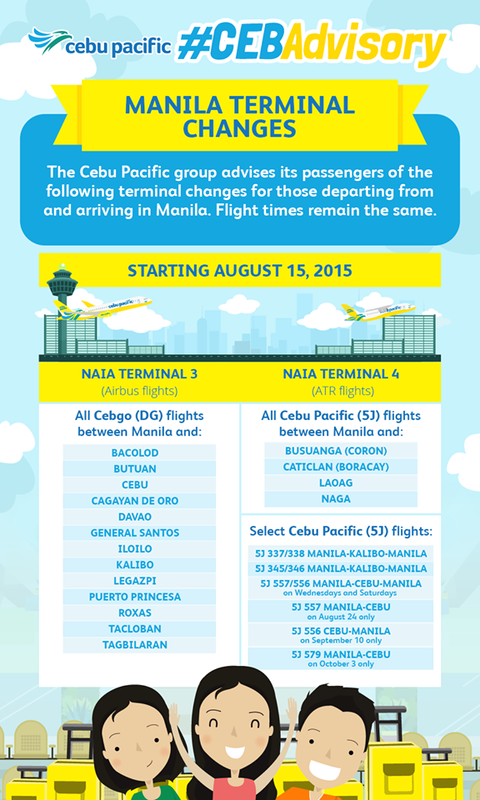 Cebu Pacific Promo Fare #CEBAdvisory: Starting August 15, 2015, Cebu Pacific flights utilizing turbo-prop or ATR aircraft, such as those from Manila to Caticlan, Busuanga, Laoag and Naga, will operate out of Ninoy Aquino International Airport (NAIA) Terminal 4. Meanwhile, all Cebgo (formerly Tigerair Philippines) flights will operate out of NAIA Terminal 3, beginning the same day. All Cebgo flights utilize jet or Airbus A320 aircraft. This is in line with the Manila International Airport Authority (MIAA) advisory, dated May 28, 2015, to maximize runway space at NAIA. CEB fully supports this government effort to improve air traffic conditions in Manila.